Did you know that life is like an obstacle course? It’s exciting and fun, but full of tricky spots to get through. If you’re a kid who feels so frustrated by those tricky spots that it’s hard to enjoy the good things in life, this book is for you. 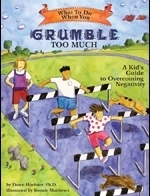 What to Do When You Grumble Too Much guides children and their parents through the cognitive behavioral techniques used to treat negative thinking. Lively metaphors and illustrations make difficult concepts easy to understand, allowing children to see life’s hurdles in a new way. 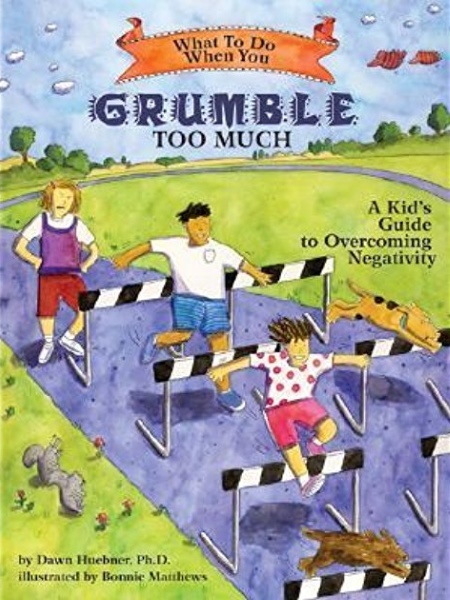 Step-by-step instructions, along with prompts to draw and write, help children master new skills to get past those hurdles, transforming negative thinkers into happier, more positive kids. This interactive self-help book is the complete resource for educating, motivating, and empowering children to work toward change. Published by Magination Press with illustrations by Bonnie Matthews. Dr. Huebner has a gift for describing abstract issues in simple, concrete terms… a unique resource that helps children practice how to think differently. Highly recommended.